It may be helpful to sketch a basic diagram of the outside of your house when planning your lights to visualize the hanging surfaces and outlet locations and also determine which lights and clips will be best. If your house has horizontal eaves, measure around the base of the house to get a rough estimate of the roofline. If your home has peaked eaves and gutters, you may need to use a ladder and tape measure to obtain accurate lengths. Determine the type of bulb you want to use as well as which light clips will be best for your roof. You will need one clip per light bulb but it is better to have a few extra. If you don't already have Christmas lights, you can choose from convenient Christmas light sets or select your bulbs and stringers separately. C7 or C9 light bulbs and icicle lights are the most popular Christmas lights for hanging across gutters and roof overhangs. C7 bulbs are the classic Christmas light size and a favorite among Christmas enthusiasts while C9 bulbs are slightly larger, perfect for creating bold, high impact lighting that can be seen from longer distances. Which Light Clip is Best? Vertical or horizontal? 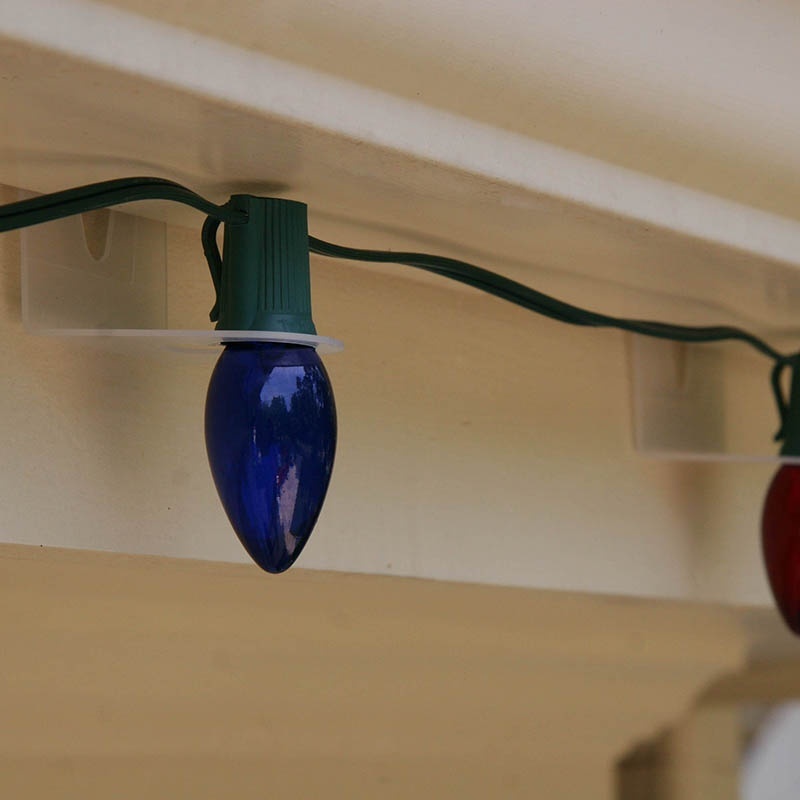 When installing Christmas lights on gutters, some clips will allow bulbs to face either direction while others can only provide one hanging option. After you determine which direction your lights will hang, use the chart to the right to decide which light clip is will work best for your lights. Note: Most Christmas light tabs for gutters can also be used for shingles, so if you are hanging Christmas lights from gutters and shingles, you may be able to use the same light clips for both applications. Attach a clip to the base of each light in the direction you plan for your lights to hang. Place your ladder on the side nearest your outlet. This is where you will begin hanging your lights. Plug a strand of lights into an extension cord long enough to reach from the outlet to the edge of the roof with enough slack for the extension cord to follow a path along the ground against the wall upwards, then vertically up to a corner of the roof line. Set the male end of the extension cord near the outlet and check that it stays in place as you climb upward to your roof. Attach your first light clip beside the extension cord to the edge of the gutter. 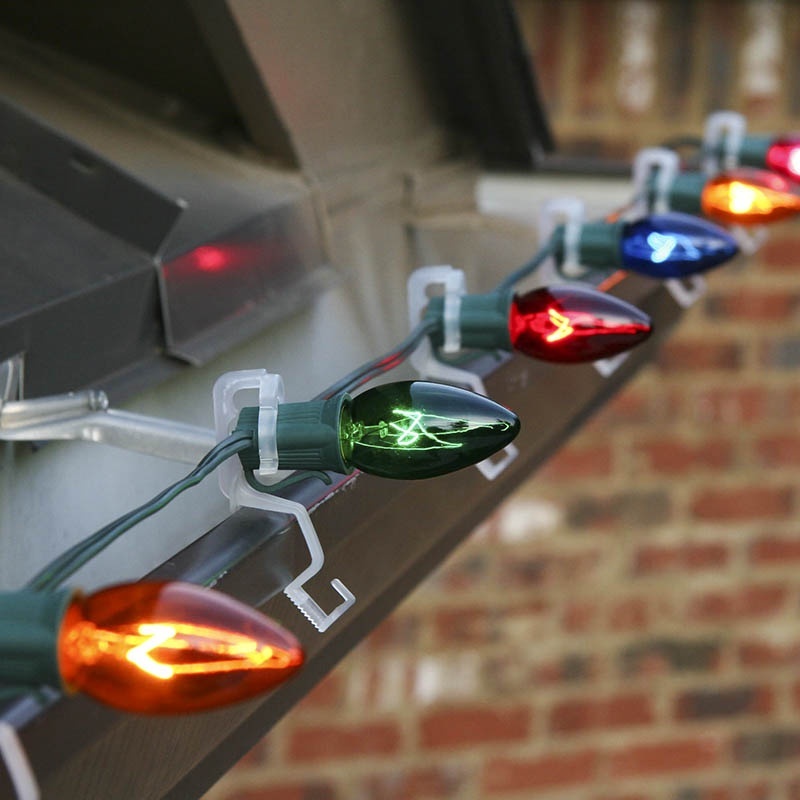 Keep your light string fairly taut as you continue to clip each bulb across your gutter. You will need to reposition the ladder as you go so be sure not to overextend yourself or shift your balance away from your ladder. If necessary, plug a second light string into the first. Then continue to clip your light bulbs in place as you did with the first. When you come to the end of your gutter, either run the remainder of the strand down the side of your house or continue upward to your peak. Light caps or electrical tape can be used to cover unused sockets, protecting them from the elements. If you are starting with a new strand, repeat steps 1-3 above. If you have just finished hanging lights across your gutter and are continuing with the same strand across your peak, use socket caps or electrical tape to cover the sockets not in use leading up to the peak. Place a shingle tab over the first socket to be used and screw in your light bulb. Slide the shingle tab in the gap between the house and your shingle so that it fits snug. Continue instering shingle tabs along the peak of your house until you reach the other side. From here you can either continue on to the gutters, using socket caps or electrical tape to cover unused sockets between locations, or start with a new light string to continue hanging lights on your remaining gutters and peaks.